Exclusively Entertainment invites you to AIR with a twist! 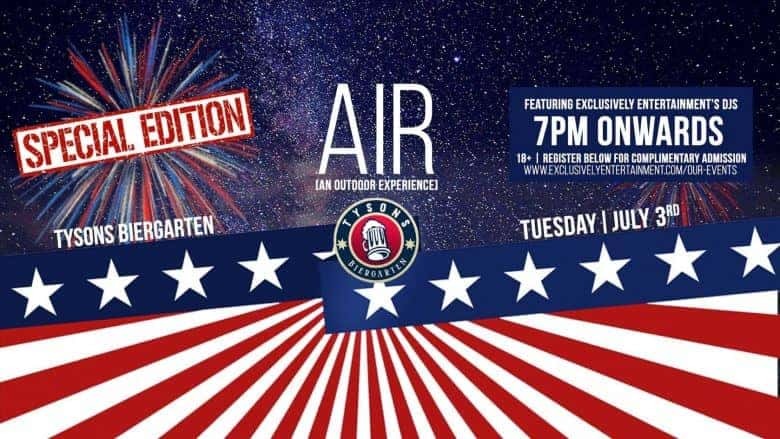 In honor of Independence Day, we hope you join us on Tuesday, July 3rd from 7pm onwards for a very special and patriotic edition of AIR! Come wearing red, white and blue and enjoy drinks, hookah and music under the stars featuring our EE DJs spinning the best of everything ranging from Top 40 to old school, to International. Check out our latest commercial via the link below, which includes highlights from past AIR events! What better gift to give Dad than an afternoon full of good beer and good company? Festival season is in full swing! We’re holding an American Tribute to World Beers festival this Father’s Day weekend, on Saturday, June 16th. We’ll have different international and American craft beers with world styles! Bring out the whole family – we’ll have live music, a pet-and-kid-friendly patio with doggy bowls, a playground, and more activities for kids. Of course, we’ll also have 50+ beers from 25+ breweries to try! Get a taste of that international flavor. This event goes from 1-6PM and you don’t want to miss it! Tickets on sale now! Watch this space for brewery and beer announcements. Exclusively Entertainment invites you to cheer for Iran during the 2018 FIFA World Cup! 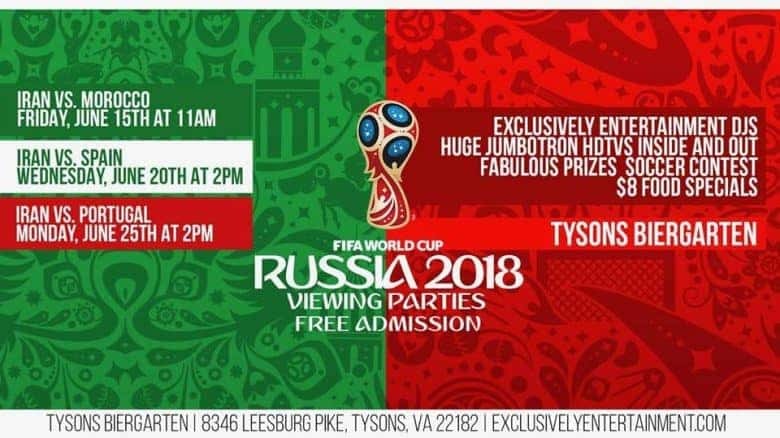 We’re excited to host the viewing parties for their 3 group matches at Tysons Biergarten. The first match will take place Friday, June 15th at 11am vs. Morocco! Join us starting at 10am for a FREE event that the entire family can join, including food specials, soccer contests and fabulous prizes. Of course, EE’s DJs will be spinning all the Persian hits as we cheer them to victory! Just don’t forget to wear green, white or red! Exclusively Entertainment invites you to cheer for Iran during the 2018 FIFA World Cup! We’re excited to host the viewing parties for their 3 group matches at Tysons Biergarten. The second match will take place Wednesday, June 20th at 2pm vs. Spain! Join us starting at 1pm for a event that the entire family can join, including food specials, soccer contests and fabulous prizes. Of course, EE’s DJs will be spinning all the Persian hits as we cheer them to victory! Just don’t forget to wear green, white or red! FREE admission! No age limit! Exclusively Entertainment invites you to cheer for Iran during the 2018 FIFA World Cup! We’re excited to host the viewing parties for their 3 group matches at Tysons Biergarten. The third match will take place Monday, June 25th at 2pm vs. Portugal! Join us starting at 1pm for an event that the entire family can join, including food specials, soccer contests and fabulous prizes. Of course, EE’s DJs will be spinning all the Persian hits as we cheer them to victory! Just don’t forget to wear green, white or red! You may wonder where the beer you are drinking comes from. What brewery, country and even how long that beer has been around. What many people do not know is that the Hofbrauhaus commonly known as the “Hofbrau” has been around far longer then most beers, since 1589. Over 400 years ago, the Duke of Bavaria, Wilhelm V, created the Hofbrau beer in Munich, Germany to give his people the better tasting beer that they were asking for. Originally the Hofbrau beer was made in royal breweries for people of class, until 1828 when the first Hofbrauhaus Inn was created in order for anyone to be able to enjoy this delicious beer. During the Second World War “Hofbrauhaus House” which was one of the most famous breweries in the world was bombed, but that was not the end of the Hofbraus era. Throughout the past few years, many Hofbrauhaus breweries have been built throughout the United States. 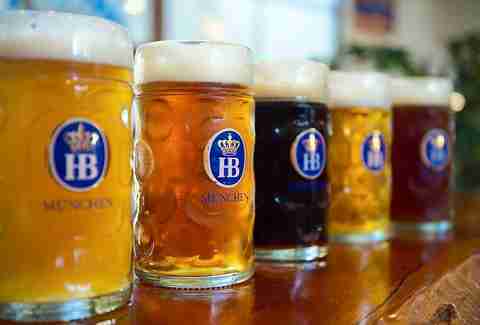 The Hofbrau brewery has many delicious beers that we at the Tysons Biergarten have available for customers. Some of the ones we have available include the Delicator, Lager and Dunkel. To learn more information about the history of the Hofbraus, click here! Aventinus is a full-bodied and malty beer with notes of raisins, plums, and marzipan made in Bavaria, Germany. 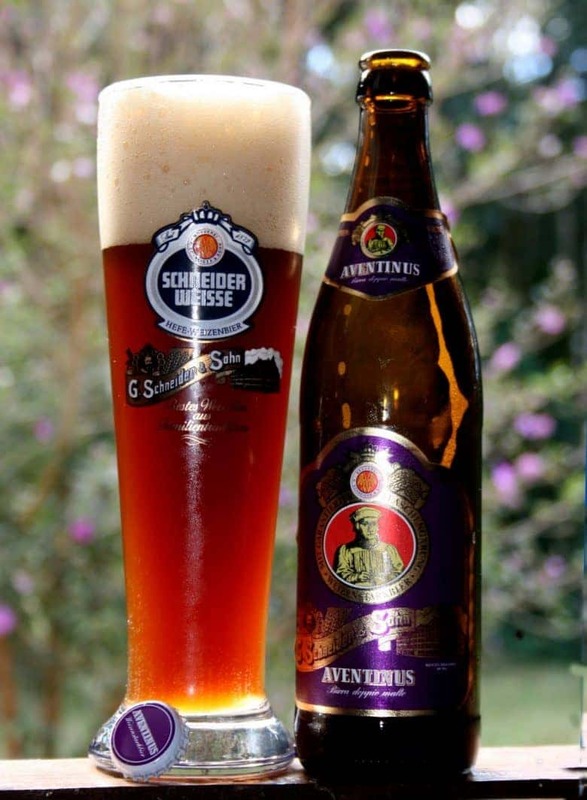 Brewed by G. Schneider & Sohn brewery, the aventinus has an ABV of 8.2% and is a wheat doppelbock. It pairs well with roasted meats and chocolaty desserts. Our owner’s all time favorite beer, the Schneider Weisse Aventinus, is an award winner and has won 6 gold medals at the European Beer Star Competition. The world’s oldest wheat doppelbock was created in 1907 by Georg Schneider III’s young widow, Mathilda. Breaking with doppelbock naming tradition (most end with “-ator”), she named the beer after the Aventinustrasse in Munich, the original brewery’s address. 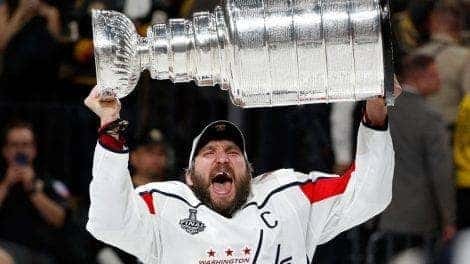 Join us in celebrating the Capitals Stanley Cup victory tonight starting right after work at 5pm. Happy hour is until 9pm with plenty of beer and food for everyone. Perfect patio weather for a Stanley Cup celebration! #RocktheRed!